Well you'd know that if you follow me on Twitter or Facebook, but hey, I'm back here! I'm still digesting what I heard on the trip. There's a lifetime to digest. A big chunky soup of feminism, violence against women, poverty, foreign policy, privilege, language, love, pain, bravery, history, bureaucracy and tears. I did want to quickly post to say hi to everyone. 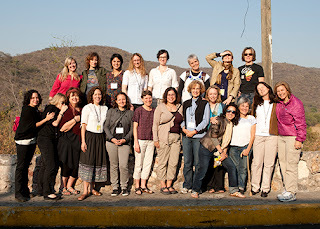 And to post this fab pic of the delegation on our way to Guerrero to hear from the women of Guerrero. We started out super early, thus me wearing my glasses. A classmate asked me if I went on my trip by myself. I said, "Yes, but soon gained a bunch of sisters." After what we experienced, we are certainly bonded to each other forever.